When the existence of emotional intelligence (or EQ) was revealed for the first time, it appeared as the missing link to explain this strange fact: 70% of the time, people with an average IQ performed better than others with a higher IQ. This anomaly totally undermined the generally accepted idea that IQ was the only factor in success. Today, decades of research refer to emotional intelligence as the critical factor that differentiates the best individuals from the crowd. The causal link is so clear that 90% of the best performers have a high emotional quotient. Research estimates that IQ accounts for only 20% of professional success and that EQ (at an interpersonal and intra personal level), apart from the candidate's personality, is a better predictor of success. It is the mixture of these three components that determines success. EQ refers to the way a person manages their emotions, interacts with others, decrypts and adjusts to different cultural environments, and influences others positively. In short, it is about the human qualities of an individual. Emotional intelligence is this intangible "little something" in each of us. It affects how we behave, manage the complexities of life, and make the personal decisions that will lead to the best results. 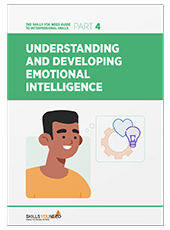 Emotional intelligence is an awareness of your own feelings and how you manage them, as well as understanding their impact on your surroundings. It also involves self-control and the ability to perceive the emotions of others, as well as an empathic response. EQ makes a substantial contribution to increasing productivity, creativity and retention of talent as well as well-being. It can represent a significant competitive advantage in the current environment. Throughout my research, I have identified 6 characteristics shared by people with low EQ. These are the reactions that it would be wise to eliminate. Repressed feelings tend to create tension, stress and anxiety. Emotions that are repressed put the mind and body under pressure. Having high emotional intelligence helps you to manage stress by allowing you to identify and deal with difficult situations before they escalate. Those who do not use their emotional intelligence may resort to less effective ways to manage their moods. They are twice as likely to experience anxiety, depression, addiction and even suicidal thoughts. Negative emotions caused by a persistent grudge are a source of stress. The simple fact of remembering a specific event causes an alarm reaction in your body, a survival reflex that, in the face of a threat, pushes you into fight or flight mode. When the threat is imminent, this mechanism is essential for your security; if it is already old, feeding this stress is harmful to your body and can even have long-term, serious consequences on your health. In fact, researchers have shown that feeding feelings of stress is likely to raise blood pressure and cause cardiovascular disease. To cling to your grudge is to cling to your stress, which emotionally intelligent people are always careful to avoid. Quite the contrary, getting over resentment provides not only relief, but also health benefits. People who have no control over their emotional lives are constantly engaged in internal battles that sabotage their ability to focus on their work and to have clear thinking. People with a high EQ tend to have a good education, empathy and benevolence, but also the ability to assert themselves and set limits. This delicate balance is ideal for managing conflicts. Most people, when upset, automatically adopt a passive or aggressive stance. However, emotionally intelligent people stay firm and avoid excessive emotional reactions. This allows them to neutralize individuals who are difficult, or even toxic, without making enemies. counterproductive actions. People with a high EQ control their emotions because they understand them, and use an emotional lexicon developed to describe them. Where the majority will simply say that they don’t feel "well”, emotionally intelligent people will know if they are currently “irritable", "frustrated", "oppressed" or "anxious". The more precise the terms are, the more we are able to understand exactly what we are feeling, why, and what to do about it. Emotionally intelligent people take a step back from their mistakes, without forgetting them. By keeping a reasonable distance, but not to the point of losing sight of the facts, they are able to adapt their behavior to better succeed in the future. It takes a great self-awareness (one of the key points of emotional intelligence) to find that balance between memory and rumination. To obsess and ruminate about your mistakes will make you anxious and fearful, while forgetting them completely will condemn you to repeat them forever. It is your ability to change your mistakes into progress opportunities that will allow you to find a proper balance. It will make you even more likely to get up right after each fall. Emotional intelligence is not just being nice. It is knowing how to manage your emotions to obtain the best possible results, which sometimes implies showing when you are sad, frustrated or upset. Constantly hiding your emotions under a happy and positive mask is neither sincere nor constructive. Emotionally intelligent people can express their negative or positive emotions, depending on the situation. As a matter of fact, an emotion has three stages: the charge, when the emotion is caused by the cognitive system, the response, and the release of the emotion, or evacuation. In most cases, the evacuation is manifested by screams, crying, or naming the feeling. If the emotion cannot be evacuated (because of good morals, the fact that crying in public is not ideal for your social life, or that shouting is often badly perceived), the real emotion is then transformed into a parasitic emotion. A parasitic emotion is a buried emotion. A parasitic fear is not a natural fear. For example, a person who is afraid of flying has a disturbing emotion that he or she can unlearn emotionally. "Real" emotions do not last more than ten minutes, often less. Other longer-felt emotions are "parasitic emotions” or “interference emotions", caused by a strong emotion that happened in the past, but which was not released. You can work on the management of your parasitic emotions that flow from your past and old real emotions that you have not yet evacuated. Discharging your unwanted emotions would make you feel good, be more serene, which can be an advantage when in business. Try to identify them and let them go. Unlike IQ, EQ is extremely malleable. When you train your brain through repeatedly practicing emotionally intelligent behavior, you build the necessary connections within the brain to make it a way of life. The more the brain consolidates the use of these new skills, the more the connections on which our harmful habits depend disappear. Just like learning a new language, if you create new patterns based on your new skills, you will quickly begin to show emotional intelligence in response to your environment, in a natural way. Mylene Garot is an outstanding business development executive and Emotional Intelligence expert with extensive success in driving strategic innovation, revenue growth and Emotional Intelligence coaching, with over 10 years of marketing, business development, and start-up experience. Mylene is the author of The Emotional Intelligence Guidebook (for Successful People).